Box Text: What's a hero to do? A mysterious flying saucer just made off with Master Higgins' girlfriend and it's up to him to save her! But first he must defeat scores of mutated monsters across eight uncharted islands! Fly a dive-bombing pterodactyl or ride under the waves on a sea serpent in search of the missing Jeannie Jungle! Battle your way through all new dangers and challenges on the biggest Adventure Island yet! Find secret treasure chambers, surf through killer waves and grab all the bonus items you can handle as you master each realm! Action, adventure and more await you in this thrilling addition to the Adventure Island saga! 10-28-2012 exonerator Box Text What's a hero to do? A mysterious flying saucer just made off with Master Higgins' girlfriend and it's up to him to save her! But first he must defeat scores of mutated monsters across eight uncharted islands! Fly a dive-bombing pterodactyl or ride under the waves on a sea serpent in search of the missing Jeannie Jungle! Battle your way through all new dangers and challenges on the biggest Adventure Island yet! Find secret treasure chambers, surf through killer waves and grab all the bonus items you can handle as you master each realm! Action, adventure and more await you in this thrilling addition to the Adventure Island saga! 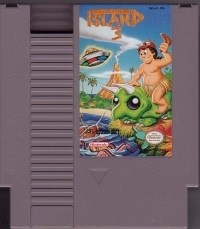 This is a list of VGCollect users who have Adventure Island 3 in their Collection. 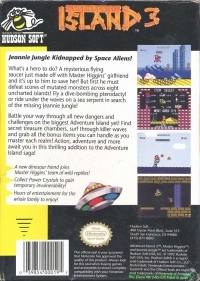 This is a list of VGCollect users who have Adventure Island 3 in their Sell List. 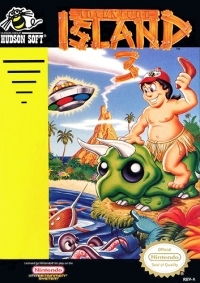 This is a list of VGCollect users who have Adventure Island 3 in their Wish List.